Looking for a Used Phantom in your area? CarGurus has 95 nationwide Phantom listings starting at $79,950. Looking as if it was cut from a single piece of granite and sporting a classic front-end grille as vertical and prominent as the Cliffs of Dover, the Rolls-Royce Phantom 4-door sedan rolls into 2014 as the epitome of luxury automaking. Clean and angular with crisp lines and a solid presence, the Phantom definitely makes a statement on the road or in the driveway. Although its name and legacy date back to the 1920s, the current Phantom debuted in 2004, although it received a number of upgrades in 2013, resulting in its designation as the Phantom Series II. New features included a new single-piece radiator grille, a redesigned rear bumper, new wheels, an 8-speed automatic transmission, a simplified seat design, a revised dashboard with a larger 8.8-inch touchscreen and updated audio and connectivity systems. Essentially built and assembled by hand at the automaker's factory in Goodwood, England, the Phantom continues to serve as the British automaker's flagship vehicle, with nearly endless customization options available. Competitors are few and include the Bentley Mulsanne, as well as less-expensive vehicles like the Aston Martin Rapide, the BMW 640i Gran Coupe and the Mercedes Benz S63 AMG. The Phantom remains a unique luxury vehicle in a number of ways. The rear doors, called coach doors by Rolls-Royce (and suicide doors by others), are hinged at the rear and power-operated to ensure easy closing. The rear doors also include umbrella slots, complete with Rolls-Royce-branded umbrellas, so occupants have one right at hand in case of inclement weather. The Spirit of Ecstasy ornament at the top of the Pantheon grille glows with blue LED light and retracts into the grille at the touch of a button to prevent theft. And the R-R-embossed hub centers on all 4 wheels self-right themselves, so the R-R logo is always upright. Each of the wood veneers in the cabin, made from walnut, elm or exotic woods like Malabar and Dark Wenge, comes from a single tree, ensuring a consistent color, grain and look. In place of a traditional tachometer on the instrument cluster, Rolls-Royce opts for a Power Reserve dial, which lets drivers know how much spare power remains from the engine. At a speed of 70 mph, for instance, the Phantom uses only about 10 percent of available power, as indicated on the dial. The 8.8-inch touchscreen, used to access the navigation and infotainment system, rotates on its central axis to hide itself when not in use. Similarly, an optional rear-seat DVD entertainment system includes 12-inch screens, which fold into the front seatbacks when not in use. The cabin continues to exude luxury, with hand-stitched leather upholstery, all from the same batch to ensure consistency of color and texture. Owners can opt for monotone or two-tone leather upholstery and lambs-wool carpeting in a wide range of colors, as well as in customized bespoke colors. The power-adjustable heated front seats include lumbar support and memory settings, with the R-R logo embossed in all headrests for an elegant touch. For those who prefer to let the chauffeur take the wheel, 3 rear-seat options are available, including a bench-like Lounge seat with seating for 3, 2-person Individual seats with a central Occasional seat for a third rear passenger and 2-passenger Individual seats with an armrest and storage console located between the seats. As expected, the Phantom comes equipped with a wide range of standard interior features, such as a leather-wrapped multifunction steering wheel with a tilt-away feature for easy driver entry and exit, automatic climate control, navigation and a parking distance control system with front, top, side and rear cameras. A classic analog clock in the center dash serves as a reminder of the car's long history, and at the touch of a button it flips to reveal the 8.8-inch touchscreen. A 15-speaker 600-watt Lexicon audio system with satellite radio, Bluetooth, a weather band, a 6-DVD changer and a USB port also comes standard. A wide range of interior options are available, including various seat details, a full-metal dashboard, various types of veneers and trim, a slide/tilt sunroof, optional steering wheels and glovebox options, including a cigar humidor or a pen set in the glovebox. Owners can also add various types of drink coolers and drink holders throughout the cabin. Power continues to come from a hand-built naturally aspirated 6.7-liter V12 engine with direct injection and variable valve timing. It produces 453 hp and 531 lb-ft of torque at 3,500 rpm, with 75 percent of torque available at just 1,000 rpm. Working with a smooth-shifting 8-speed automatic transmission, the V12 powers the rear-wheel-drive Phantom from 0-60 in 5.7 seconds, with a top speed of 149 mph. That won't break any land speed records, but it's not bad for a car that tips the scales at 5,840 pounds. Fuel economy numbers check in at 11 mpg city/19 highway. Outside, the Phantom displays clean proportions and lines with a somewhat boxy overall appearance. The beltline runs fairly high along the sides of the car, while the roofline gently curves toward the rear. Up front, in addition to the iconic Pantheon grille and Spirit of Ecstasy, the front end includes rectangular adaptive LED headlights dissected horizontally across the center by a glowing light bar, which serves as the daytime running lights. A heated windshield, rain-sensing windshield wipers and long-life LED indicator, parking and rear brake lights are among the other exterior features. In its standard configuration, the exhaust pipes are hidden on either side of the rear bumper, although owners can opt for chrome-plated visible exhaust pipes. Like other components, the exterior paint can be customized to individual preference. 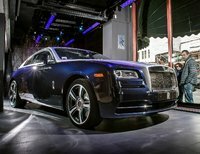 Rolls-Royce says that in addition to its regular colors, it offers 44,000 different exterior hues through its Bespoke program, giving owners an almost endless selection from which to choose. The automaker even offers a gold-plated Spirit of Ecstasy for those who want a truly unique look. The Phantom features an aluminum subframe and a sits on a long platform with a 140.6-inch wheelbase and an overall length of 230 inches, or more than 19 feet. A self-leveling air suspension with continuous electronic damping ensures a smooth and competent ride, while the double wishbone front suspension and multilink rear suspension provide good handling and maneuverability. For those who would like a sportier ride, Rolls-Royce offers a Dynamic Package, which includes a stiffer suspension, as well as a thicker sport steering wheel, tweaked shift points for the transmission and visible exhaust pipes. Power-assisted ventilated 4-wheel disc brakes come standard, but owners can opt for a performance braking system. Rolls-Royce offers 12 different wheel options, including a variety of 21-inch alloy wheels with various spoke designs and finishes. All designs include run-flat Goodyear EMT performance tires. Safety features include Dynamic Stability Control, Dynamic Traction Control, Dynamic Brake Control and Cornering Brake Control. A full range of airbags also comes standard, along with a state-of-the-art ISIS (Intelligent Safety and Information System), which uses measured braking, stability control and traction control to keep the Phantom upright and its passengers unharmed in the event of an accident. The Phantom's Bespoke program makes it customizable in just about every way imaginable. Unique interior colors and materials, add-in features, individual logos or initials and just about anything else an owner can imagine can be accomplished on the Phantom. After all, if you're going to spend this much money for one of the world's top luxury cars, you might as well make it your own. 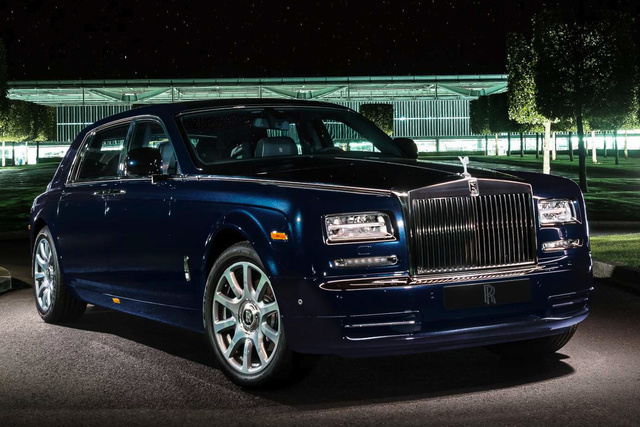 What's your take on the 2014 Rolls-Royce Phantom? 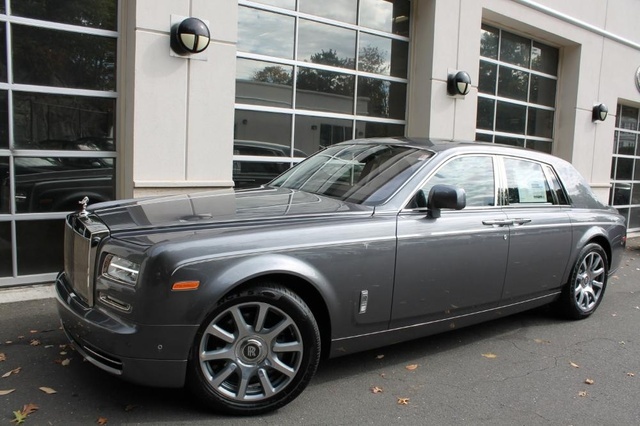 Have you driven a 2014 Rolls-Royce Phantom?